Wyandotte facies are based on a combination of features observed in the rock, potential genetic significance of those features, and dimensions of the facies unit. Several micritic facies were differentiated on the basis of fossil assemblages and primary structures which are environmentally significant. The calcarenite facies was defined as a mixture of different end-member constituents (Fig. 21). Because facies represent sediments formed contemporaneously side by side, they are bound to be intergrading and interfingering, owing to lateral shifting of environments. Boundaries of facies thus are arbitrary and fixed on diagrams only as a matter of convenience for discussion. Facies characteristics are summarized in Table 3. Table 3--Summary of facies characteristics. Table 4--Lithology of samples. Numbered samples for each locality (shown on cross sections on Plate 1) are grouped according to lithologic type. Field description--The terrigenous facies consists predominantly of shale with a minor amount of sandstone. The chief rock type is gray to dark-gray, silty to sandy shale which exhibits medium to poor bedding. Quartzose sandstone occurs as cross-stratified and ripple-marked lenses as much as 3 feet thick in the middle Farley shale in Platte County, Missouri and as a light-gray, parallel-bedded lens in the Island Creek Shale at Locality 4. Minor rock types include a thin, limonitic, nodular layer in the middle of the Island Creek Shale at Locality 19 and nodular limestone in the upper part of the Quindaro Shale at Locality 1. Fossil assemblage--The terrigenous facies is unfossiliferous except in the top few inches, just below a shale-limestone contact. Where shales are thin, they are commonly fossiliferous throughout, as is the Quindaro at most localities and the Island Creek above algal banks near Stilwell and in the Olathe-Bonner Springs area (Fig. 9, D). The fossil assemblage in the top of the terrigenous facies (Table 2) typically extends into the lower few inches of the overlying carbonate facies. The adjacent basal layer of carbonate is a silty, packed biomicrite in which skeletal grains are locally coated with Osagia (Fig. 15, A). Crinoid columnals, fenestrate and ramose bryozoans, and brachiopods dominate the assemblage almost everywhere except in the thin Island Creek above algal banks, where a highly elongate form of Triticites occurs in great abundance (Fig. 15, A). Triticites is only a minor constituent elsewhere and is typically smaller and less elongate. Figure 15--Negative prints of thin sections of algal-bank facies. Sample number in parenthesis after locality number gives stratigraphic position on Plate 1. A, Fusulinid-bearing silty biomicrite. Transition zone between terrigenous facies of Island Creek Shale and overlying algal-bank facies. Fusulinids (Triticites) have been broken, abraded, and some coated with Osagia (arrow). Locality 11 (12). B, Phylloid algal intrasparrudite. Thin layers of micrite (M) have been broken into intraclasts. Small, angular, spar-replaced fragments of phylloid algae (arrow) have thin micritic envelopes that set them off from matrix. Micrite is "clotted" or pelleted. Locality 9 (5). C, Dismicrite. Layers of micrite have spar-filled triangular cracks opening both up and down from bedding surfaces (black arrows). White arrow points to fragment of Anchicodium. Locality 1a. D, Intramicrudite. Rounded intraclasts (arrow) in micrite matrix. Locality 9 (7). Stratigraphic relationships--The shale members of the Wyandotte, whose distribution has been discussed previously, comprise the terrigenous facies. A few shale partings between the thin, wavy limestone beds of the algal-bank facies widen locally to several inches. These lenticular shales show no tendency to become thicker or more numerous toward areas where the shale members are thicker and, therefore, are included within the algal-bank facies. 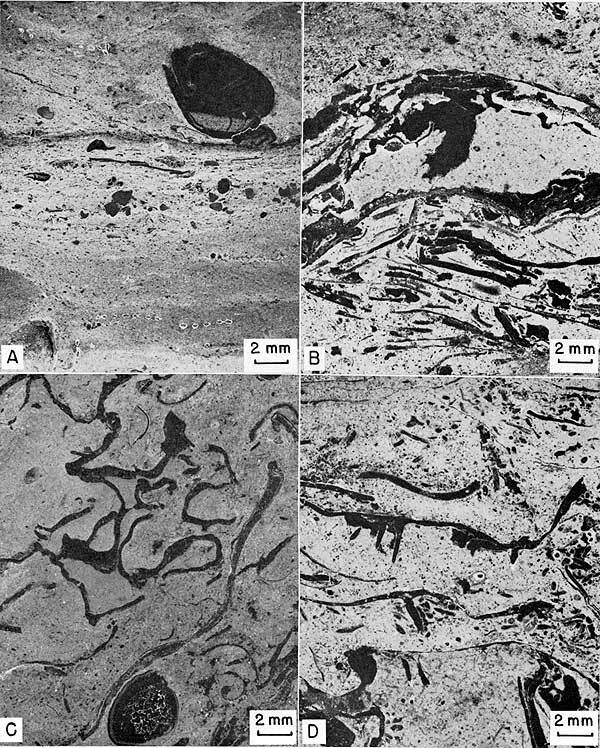 Figure 16--Negative prints of thin sections of stromatolite-sponge facies. Sample number in parenthesis after locality number gives stratigraphic position on Plate 1. A, Stromatolitic biolithite. Mudcracked biomicrite beneath algal-stromatolite crust (C). Algae encrust and are encrusted by calcitornellid foraminifers (arrows). Locality 21 (2). B, Stromatolitic pelmlcrite. Algal-stromatolite (C) encrusting blade of Archaeolithophyllum missouriense (Arm). Encrusting bryozoan beneath algal blade suggests blade was once upright. Locality 21 (2). C, Stromatolitic biolithite. Calcisponge fragment (arrow) surrounded by dismicrite and covered by algal-stromatolite crust (C). Locality 21 (2). D, Phylloid algal pelmicrite. Large blades of Anchicodium (An) lying concave-upward and filled with pelmicrite. Limonitic, silty micrite beneath blades contains possible calcite pseudomorphs after anhydrite or celestite (arrow), some with hexagonal cross sections. Spar (S) fills primary voids beneath higher parts of blades. Locality 1 (3). Petrographic description--Microscopic examination of the stromatolitic crusts reveals irregular layers of micrite, microspar, (Fig. 17, E, F) encrusting cyclostome bryozoans, and calcitornellid and tetrataxid foraminifers. Some stromatolites encrust blades of the phylloid alga Archaeolithophyllum (Fig. 16, B; 17, E). Fragments of Archaeolithophyllum and Anchicodium may occur in the micrite between stromatolitic crusts. The alga Anchicodium locally forms a blade-supported intramicrudite in which micrite and small intraclasts or pellets fill depressions on top of the blades (Fig. 16, D). Angular grains that may be calcite pseudomorphs after anhydrite or celestite (Illing, Wells, and Taylor, 1965, p. 97; Beales, 1965, p. 69) occur in a micritic matrix in one specimen (Fig. 16, D). Microspar fills some burrows and mud cracks. Figure 17--Photomicrographs of thin sections of constituent grains and algal structures. A, Two Anchicodium blades. Note parallel thread-like utricles perpendicular to outer margin of blades. B, Eugonophyllum? blade across center. Note cross section of rounded utricles connected by branchlets perpendicular to margin of blade. C, Portion of intraclast showing smooth surface (bottom) that is mold of an algal blade; uncompacted micrite is composed of pellets with "fluffy" boundaries and thus appears "clotted." Note increase in packing density downward away from top sheltered by next higher algal blade. D, Archaeolithophyllum missouriense with typical cellular structure. E, Algal-stromatolite crust on top of Archaeolithophyllum missouriense blade with cellular structure (Arm). Note lack of skeletal structure in stromatolite. F, Algal-stromatolite crust showing interlayered micrite, microsparite, and various encrusting organisms. The dark color of this facies may be due primarily to presence of sulfides disseminated throughout the micrite. Pyrite and sphalerite crystals are apparent in the field and on polished slabs. These minerals were not detected in the other carbonate facies. 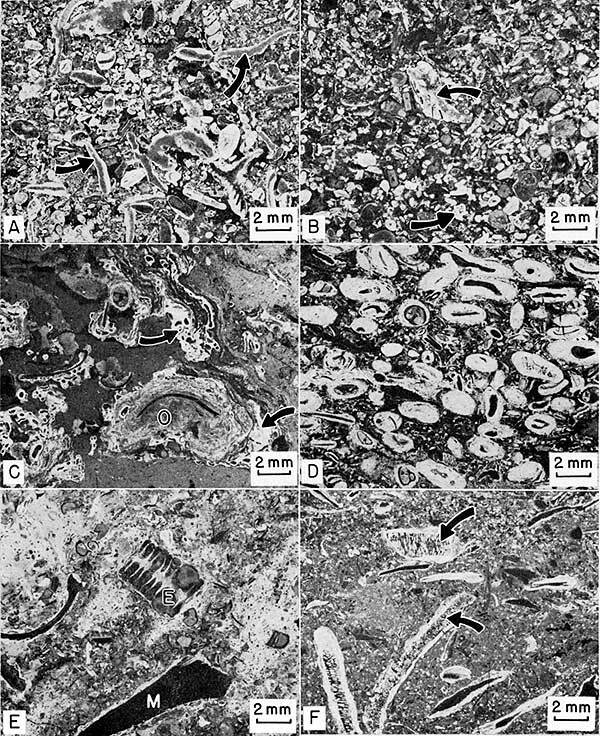 Fossil assemblage--The biota associated with the laminated algal crusts includes forms characteristic of the terrigenous facies; however, the fauna is more diverse, except in the transitional beds at the base (Table 2). Blades of the phylloid algae Archaeolithophyllum and Anchicodium, calcisponges, encrusting foraminifers, Ambocoelia, trilobites, ostracodes, and unidentified burrows, distinguish the biota of this facies from that of the terrigenous facies. Calcisponges occur as unencrusted whole fossils or as fragments associated with and locally encrusted by stromatolites (Fig. 16, C). These sponges may belong to the family Wewokellidae King, 1943. Stratigraphic relationships--The stromatolite-sponge facies comprises all the Frisbie Limestone Member north of the interbank area and the basal few feet of the Argentine Limestone in Platte County, Missouri, and at Localities 4 and 5 near by in Kansas. This facies overlies the terrigenous facies and is either overlain by a thin wedge of the terrigenous facies or, in the Argentine, is gradational upward into the algal-bank facies. Field description--The algal-bank facies is a light-gray to buff, relatively soft, thin, wavy-bedded biomicrite. In a fresh exposure the wavy beds are separated by concentrations of paper-thin layers of dark argillaceous material enclosing oriented and typically fragmented fossil debris (Fig. 18, A). Weathering tends to widen these dark layers (Fig. 9, C), differentially exposing the fossils and coloring the limestone beds with a buff to yellow limonitic stain. Figure 18--Negative prints of thin sections of algal-bank facies. Sample number in parenthesis after locality number gives stratigraphic position on Plate 1. A, Biomicrite. Horizontal argillaceous laminations that contain brachiopod and crinoid fragments tend to weather back from outcrop and cause surrounding pure biomicrite beds to stand out in relief (Fig. 9, C). Locality 11 (13). B, Blade-supported Anchicodium biomicrite. Algae and calcitornellid foraminifers encrust blades. Locality 1 (18). C, Phylloid algal biomicrite. Phylloid algae, possibly Archaeolithophyllum. Acetate peel. Locality 17 (5). D, Phylloid algal biomicrite. Phylloid algae, possibly Eugonophyllum. Locality 1a. Biomicrite beds average about 6 inches in thickness but range from 1 inch to as much as 1 foot. Internal stratification is evident in parallel to subparallel orientation of the large phylloid algal blades and some productid shells, but most finer bioclastic material appears randomly oriented. Thin beds of nodular chert and associated dolomite rhombs occur in the middle or lower part of the algal-bank facies in the Argentine Limestone. Large chert nodules are abundant only locally, as at Locality 26 in the Stilwell bank area, and disappear within 2 miles. This chert tends to obliterate primary structures and some fossils and appears to be definitely secondary in origin. Petrographic description--The algal-bank facies characterizes thicker parts of limestone members but in several areas persists into the thinner units. In the thick portions of the facies, however, the phylloid algal biomicrite has a disturbed or intraclastic primary texture, which is not found in the thinner units. Throughout the thickened portions of the bank, the lithology ranges from undisturbed biomicrite to unrounded and rounded intrasparrudite. The entire range of disturbed primary texture can be observed within a few feet vertically and laterally at any one locality. No regular vertical variation of primary texture is maintained from one outcrop to another. Biomicrite characteristic of the algal-bank facies contains from 50 to 95 percent micrite. The amount of bioclastic material required to form a packed biomicrite, in which grains support each other, varies with size and shape of the grains. Perhaps as little as 20 percent bulk abundance of large curved blades of phylloid algae or large fenestrate bryozoans can support each other, as suggested experimentally by Dunham (1962). Smaller fragments of these fossils or such grains as brachiopod shells must form 30 to 50 percent of the rock to be grain-supporting. Spar-filled voids beneath the shelter of organic fragments is good evidence of grain support. Most of the carbonate mud matrix is less than 5 µ in grain size but in a few cases there is some matrix material in the size range of 10-30 µ. This larger matrix material may be either microsparite, formed by grain enlargement from micrite, or finely comminuted bioclastic debris. In many specimens micrite is loosely packed and has a "clotted" appearance where it has been sheltered from compaction by supported algal blades. These "clots" somewhat resemble pellets in that they have no internal structure and range in size from 30-50 µ (Folk, 1959). Their poorly defined grain boundaries, however, give them an irregular, indistinct outline, and they appear to be aggregates of micrite set in spar (Fig. 17, C). An increase in packing density causes obliteration of the clots or pellets resulting in a more solid micritic matrix. The change from loosely packed, clotted micrite to more densely packed, homogeneous micrite may occur within a few millimeters vertically (Fig. 17, C). Internal stratification in the biomicrite is evident in only a few samples containing horizontal blades of algae (Fig. 19, D). Most biomicrite has been stirred and burrowed. Figure 19--Negative prints of thin sections of algal-bank facies. Sample number in parenthesis after locality number gives stratigraphic position on Plate 1. A, Intramicrudite. Intraclasts in darker micrite matrix. Primary voids between some intraclasts filled with spar. Small angular fragments of phylloid algae (arrow) have been replaced with spar but are defined by thin micritic envelopes. Some of "muddy" matrix is relatively coarse-grained and seems to be composed of finely broken skeletal debris or pellets. Locality 9 (6). B, Phylloid algal dismicrite. Layers of dismicrite and intramicrudite. Intraclasts (arrow) are very indistinct and seem deformed around other clasts. Locality 5 (12). C, Phylloid algal intrasparrudite. Much of the spar-filled space in center contains fragments of Archaeolithophyllum (Ar) defined by thin micritic envelopes. Spar also fills primary voids between intraclasts. Intraclast (I) shows smooth, wavy surface boundary on left side that is a mold of the surface of a phylloid algal blade, and "clotted" surface on right side that was probably an uncompacted surface sheltered by other algal blades before clast was moved out of place (enlarged view, Fig. 17, C). Note cracks in micrite (curved arrow) that diminish in both directions and do not extend to surface. Locality 29. D, Blade-supported phylloid algal dismicrite. Algal blades have been dissolved and micrite matrix has caved into voids beneath blades. Note smooth surface that was against algal blade and irregular "clotted" surface that was protected from compaction beneath original blade. (Compare with intraclast in Fig. 19, C). Voids are filled with spar. Acetate peel. Locality 30. Previous existence of phylloid algal blades within dismicrite or intrasparrudite can be detected by subtle primary textures. [Note: "Dismicrite" is Folk's (1959, p. 28) term for disturbed micrite with less than 1 percent allochems. In this study the term is used for micrite containing more than 1 percent allochems, only a slight deviation in terminology.] Color mottling and differential compaction of micritic clots within intraclasts, which have a smooth, undulating base, indicate compaction onto an algal blade, which was later recrystallized or dissolved (Fig. 19, C). In other examples, only thin micritic envelopes (Bathurst, 1964) around the sparry calcite of algal fragments set them off from void-filling spar (Fig. 15, B). Disturbance and fragmentation of biomicrite ranges from slight cracks to angular intraclasts exhibiting slight movement (Fig. 19, C) to intraclasts abraded into rounded lumps (Fig. 15, D). This range may be observed in a single specimen. Cracks are often triangular, opening at an obscure bedding plane, and gradually diminishing a short distance into the micrite (Fig. 15, C). These triangular cracks occur both up from and down from the margins of a micrite layer or intraclast (Fig. 15, C). A few cracks open within a single biomicrite layer and diminish in both directions before reaching a bedding-plane surface (Fig. 15, C; 19, C). Cracks and spaces between angular intraclasts are typically not filled with micrite (Fig. 15, B, C). Rounded intraclasts, indicating more disturbance of the sediment, are associated with more micrite filling spaces between them (Fig. 15, D; 19, A). Sparry calcite fills most voids except for the interiors of some large brachiopods. Skeletal material has either been recrystallized or the original material dissolved out and sparry calcite precipitated in its place. In some cases the enclosing micrite has collapsed into the void before spar was deposited, leaving only a thin outline of the shape of the skeletal fragment (Fig. 19, B, D). Fossil assemblage--The dominant fossils of the bank facies are phylloid algae represented by the green codiacean Anchicodium Johnson (1946) (Fig. 17, A; 18, B) and the red corallinacean Archaeolithophyllum missouriense Johnson (1956, Fig. 17, D; 19, C). Abundance of phylloid algae generally shows few detectable trends in individual bank development. An exception is the increase in relative abundance of Archaeolithophyllum upward in the Argentine. In overlying banks of the lower Farley, the abundance of phylloid algae is greater and the relative percentage of Archaeolithophyllum is higher. Diversity of shapes of codiacean blades suggests that more than one species or perhaps other related genera, such as Ivanovia Khvorova (1946) or Eugonophyllum Konishi and Wray (1961) (Fig. 17, B; 18, D), may be represented in the Wyandotte. Other unidentified forms of phylloid algae that are unlike published descriptions of any of the above genera were found in some horizons of the algal-bank facies. Algal blades up to 10 cm in length occur in the micrite matrix. Where these blades were dense enough to support each other they formed sheltered cavities. Sediment with different texture or color collected in a few cavities, and sparry calcite was later precipitated in all remaining cavities (Fig. 19, D). Brachiopods, all growth forms of bryozoans, crinoid columnals, and small horn corals are found throughout the algal-bank facies (Table 2). The brachiopods are Composita, Dictyoclostus, Juresania, Echinoconchus, Marginifera, Linoproductus, and Neospirifer. No systematic variation in the relative abundance of brachiopods was detected in most of the bank facies. At certain horizons, however, they form layers of shell-supported biomicrudite up to 1 foot thick. These brachiopod concentrations have a limited lateral extent and cannot be traced from one outcrop to another. One systematic variation in brachiopod diversity first noted by Newell (1935) is apparent in the Argentine Limestone. Enteletes occurs to the exclusion of almost all other brachiopods in the southwestern part of the study area (Loc. 14, 28) but is rare to the north. The algal structure Osagia, along with cyclostome bryozoans, and calcitornellid and tetrataxid foraminifers encrust algal blades and fenestrate bryozoan fronds in the bank facies (Fig. 18, B). Skeletal debris similar to that in the biomicrite layers is concentrated along shaly bedding planes (Fig. 18, A). phylloid algal fragments are conspicuously absent from these shaly layers, either because they were rapidly dissolved and their molds not preserved, or they never inhabited these local areas. Stratigraphic relationships--The algal-bank facies comprises most of the abnormally thick portions of the Argentine and Farley Limestone members in the study area (Fig. 2). Five separate algal banks have been identified in the Wyandotte in and around Johnson County, Kansas. Four of these consist of the algal-bank facies. The exception is the bank in the upper Farley at Bonner Springs, which lithologically belongs to the Archaeolithophyllum cap facies. Cross sections of these banks are shown on Plate 1. The most extensive bank development occurs in the Argentine Limestone, which accumulated to a thickness of about 40 feet in the Kansas City-Olathe-Bonner Springs area, while an isolated bank attained a similar thickness in the Stilwell area (Fig. 2). Smaller banks developed in the lower Farley limestone over the Argentine banks at Stilwell and Olathe. A significant lateral facies change from algal bank to shelly mud occurs where the Argentine thins rapidly across the interbank area. In this change, phylloid algae are progressively replaced by fenestrate bryozoans, crinoid columnals, and productid brachiopods. A similar change occurs in the lower part of the Argentine at the north end of the study area where only 2 to 3 feet of algal-bank facies remains at the top of the member. Preservation of phylloid algae--In this study, phylloid algae were identified from published descriptions by Johnson (1946, 1956, 1961), Konishi and Wray (1961), and Wray (1964). Internal structure is rarely preserved in Anchicodium but is somewhat more common in Archaeolithophyllum. Where internal structure has not been preserved, general shape and dimension of the blades was used where possible to distinguish between the groups; however, this is difficult because of the external similarity of the two forms. Differential preservation of the two groups of phylloid algae can be explained by the stability order of the different forms of CaCO3 (Friedman, 1964). Codiacean algae are composed of aragonite, which is dissolved more easily than high-magnesium calcite, the mineral secreted by corallinacean algae. Apparently aragonite is either recrystallized or dissolved out, leaving a mold which is later filled with sparry calcite. This results in complete obliteration of original cell structure, leaving only external form. On the other hand, high-magnesium calcite seems to lose magnesium by leaching while the original calcite crystal remains intact. Because low-magnesium calcite is stable, the possibility of preservation of cell structure is increased. Nevertheless, cell structure has been destroyed in many fragments of Archaeolithophyllum. Two different forms of obliteration of the cell structure in Archaeolithophyllum are common in the Wyandotte. In one form the original texture has been obliterated by degrading crystallization (Folk, 1965), forming a texture similar to cryptocrystalline calcite described by Purdy (1963) in Recent carbonate grains in sediments off the Bahamas. The other involves solution of original or later recrystallized calcite, leaving a mold, with infilling by sparry calcite. Both forms are observed in a single blade. Cell structure tends to be better preserved in red algae in the spar matrix of the calcarenite facies than in the micrite matrix of the algal-bank facies. Field description--This facies characteristically occurs as a single bluish-gray mottled limestone bed that is more resistant than the underlying wavy-bedded algal-bank facies. It is typically closely associated with thin layers of calcarenite. In some localities these two facies are interbedded, but elsewhere large intraclasts of typical Archaeolithophyllum cap lithology are incorporated into the calcarenite facies. Petrographic description--Phylloid algae are closely associated with primary structures in micrite. Fragments of Archaeolithophyllum missouriense Johnson (1956) are typically abundant enough in the micrite to be blade-supporting (Fig. 17, D; 20, A). Burrows and spaces beneath algal blades are filled with micrite that is generally lighter in color than the surrounding matrix. Some spaces between large intraclasts are filled with biosparite similar to the overlying calcarenite facies (Fig. 20, B). The encrusting species Archaeolithophyllum lamellosum Wray (1964) binds layers and angular intraclasts of biomicrite to form a biolithite (Fig. 20, C, D). 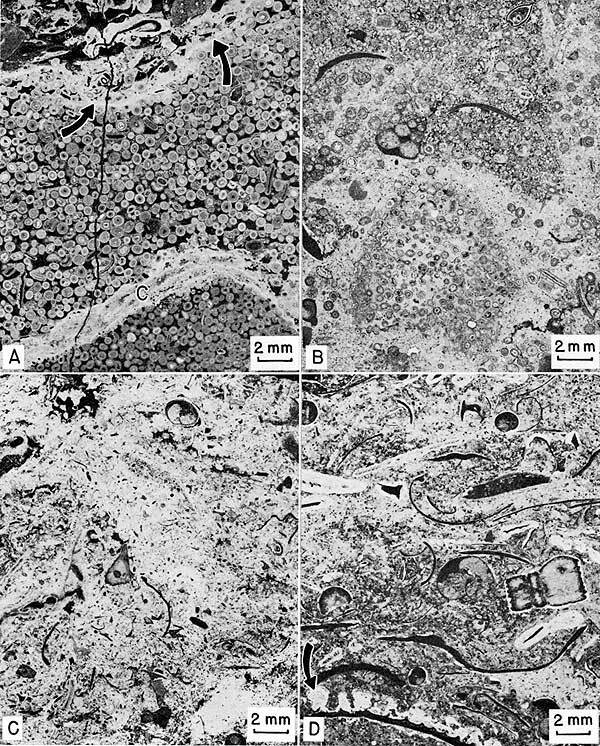 Figure 20--Negative prints of thin sections of Archaeolithophyllum cap facies. Sample number in parenthesis after locality number gives stratigraphic position on Plate 1. A, Blade-supported phylloid algal biomicrite. Fragments of Archaeolithophyllum missouriense (Arm) encrusted by calcitornellid foraminifers (F). Cell structure of algae is well preserved (see Fig. 17, C). Locality 11 (24). B, Phylloid algal biomicrite. Crack beneath Archaeolithophyllum blade (Ar) is filled with biosparite from overlying calcarenite facies. Locality 9 (12). C, Phylloid algal biolithite. Layers of Archaeolithophyllum lamellosum (Arl) bind intraclasts (I) of micrite. Clasts have been cracked by differential compaction. Locality 1 (25). D, Phylloid algal biolithite. Layers of Archaeolithophyllum lamellosum (Arl) bind layers and intraclasts of micrite. Cell structure of algae has been obliterated by recrystallization. Locality 9 (25). Fossil assemblage--Faunal diversity of the Archaeolithophyllum cap facies is much less than in the closely associated algal-bank and calcarenite facies (Table 2). Composita and high-spired gastropods are the only common invertebrate fossils in the assemblage. The micrite has been intensely burrowed, but burrowing organisms other than gastropods have not been preserved. Stratigraphic relationships--This facies occurs as thin layers, typically less than 2 feet thick, capping thicker portions of the algal-bank facies in the Argentine and lower Farley limestones (Pl. 1). It does not cap developments of algal-bank facies less than about 15 feet thick, as at Localities 17, 19, 21, and 23 in off-bank areas. The upper Farley limestone consists of alternating layers of Archaeolithophyllum biomicrudite and biolithite and biosparite of the calcarenite facies. In the Bonner Springs area the calcarenite layers are relatively thin and the whole upper Farley is considered Archaeolithophyllum cap facies. Because this unit exceeds 20 feet in thickness and is made up essentially of phylloid algae and micrite, it is termed "a bank" in this area (Fig. 2). Field description--The calcarenite facies occurs as one or several horizontal, massive to faintly cross-stratified beds ranging from 6 inches to 2 feet in thickness. It is interbedded with the Archaeolithophyllum cap facies on top of the algal-bank facies, and also occurs in places between two shale members. A thin layer of shaly pelecypod biomicrudite is commonly found at the base of the calcarenite facies above the terrigenous facies. Petrographic description--The calcarenite facies is mainly biosparite composed of three types of grains: (1) skeletal debris, (2) well-rounded micrite intraclasts containing bioclastic material, and (3) Osagia-coated grains. These types may be considered end members of a ternary system (Fig. 21). Complete gradation is found only between intraclasts and skeletal grains. Osagia-coated grains may occur with only minor amounts of the other constituents. Rocks composed mainly of Osagia-coated grains have not been set off as a separate facies because (1) these grains do occur as a minor constituent in much of the calcarenite facies; (2) nuclei of the coated grains are similar to uncoated grains found elsewhere in the calcarenite facies; and (3) not enough is known about the environmental significance of Osagia at this time to warrant distinction as a separate facies. Figure 21--Diagram illustrating end-member components of calcarenite facies. Total grain composition tends to fall within ruled areas. Figures cited show examples of grain types. Algal fragments typically show good preservation of cell structure (Fig. 22, A). Fragments of Archaeolithophyllum in which cell structure has been obliterated by recrystallization, however, are easily mistaken for intraclasts. Most grains are moderately to well sorted and well rounded (Fig. 22, B), but a few large pelecypod and brachiopod shells, as well as fenestrate bryozoan fronds, were buried before being broken. The micrite intraclasts contain gastropods and phylloid algal material, indicating derivation from the Archaeolithophyllum cap facies. Osagia-coated grains locally contain encrusting calcitornellid foraminifers (Fig. 22, D), but this algae-foraminifer association seems to be fortuitous (Toomey, 1962), and grains are bound into aggregates also by calcitornellid foraminifers alone (Fig. 22, C). Osagia-coated grains are most common in the northeastern part of the study area and are found only as a minor constituent in the calcarenite facies elsewhere. These grains occur both in the spar and the micrite matrix. 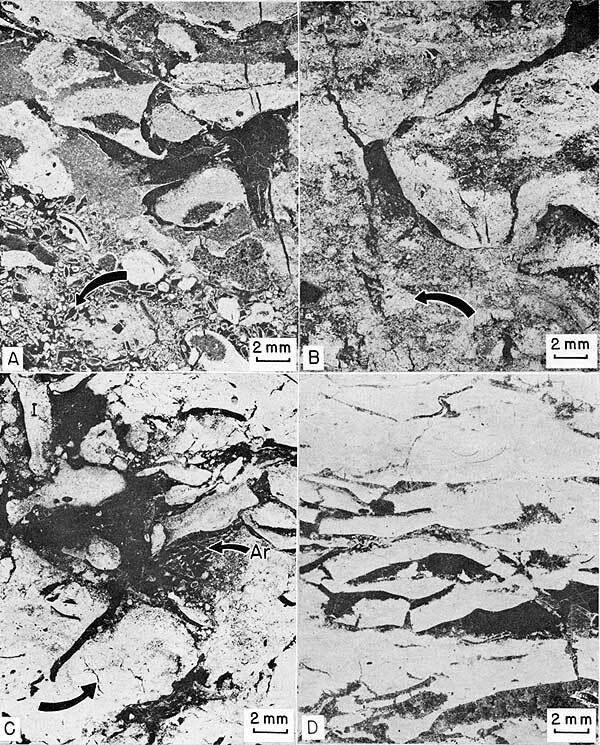 Figure 22--Negative prints of thin sections of calcarenite facies. Sample number in parenthesis after locality number gives stratigraphic position on Plate 1. A, Biosparite. Archaeolithophyllum (arrows) is predominate grain. Locality 1 (10). B, Biosparite. Rounded skeletal grains and intraclasts (arrows). Locality 9 (13). C, Osagia-calcitornellid biomicrite. Algal-coated grains (O) are bound into larger aggregates by calcitornellid foraminifers (arrows). Locality 1 (24). D, Osagia-coated biosparite. Calcitornellid foraminifers along with Osagia. Locality 21 (22). E, Mixed biosparite and biomicrite. Large crinoid stem segment (E) and large Myalina shell (M). Osagia and calcitornellid foraminifers coat many fragments. Locality 3 (11). F, Biomicrudite. Large fragments of Epimastopora (arrows) coated with Osagia. Small black specks are quartz grains. Locality 17. Fossil assemblage--Skeletal debris in the calcarenite facies includes fragments of Archaeolithophyllum missouriense, the green dasycladacean alga Epimastopora (Fig. 22, F), pelecypods, gastropods, nautiloid cephalopods, brachiopods, bryozoans, echinoderms, fusulinids and other foraminifers, trilobites, and ostracodes (Table 2). This is the most diverse biota in any of the Wyandotte facies. Especially notable are the abundant pelecypods, which do not occur in most of the micritic facies. These include Myalina, Septimyalina, Aviculopecten, and the burrowing pelecypod Aviculopinna, which was found in vertical living position at Locality 14. Stratigraphic relationships--The calcarenite facies occupies several positions relative to other facies in the Wyandotte. It occurs as massive beds 6 inches to 2 feet in thickness above the algal-bank facies in the Argentine and is interbedded with the Archaeolithophyllum cap facies. Thin layers of calcarenite facies are interbedded with the oolite facies in the lower Farley and with the Archaeolithophyllum cap facies throughout the upper Farley. Osagia-coated biosparrudites dominate the calcarenite facies at the top of the Argentine and in the upper Farley toward the northeast. Field description--The oolite facies forms typically cross-stratified beds that are generally 1 to 2 feet thick, but which may range up to 13.5 feet locally. Fossils typically stand out on the weathered surface of the oolite. Thin lenses of calcarenite are interbedded with the oolite facies. In places contacts between the oolite facies and other facies are gradational, but locally they are erosional. Slabby layers of shaly biomicrite containing ooid-filled burrows mark the base of the oolite facies where it overlies terrigenous facies. Petrographic description--Most of the facies is well sorted oosparite (Fig. 23, A), but locally it is poorly sorted oomicrite in which some ooids are not in contact. Intraclasts of oomicrite and burrow mottling are apparent in the micritic portion of this facies (Fig. 23, B). 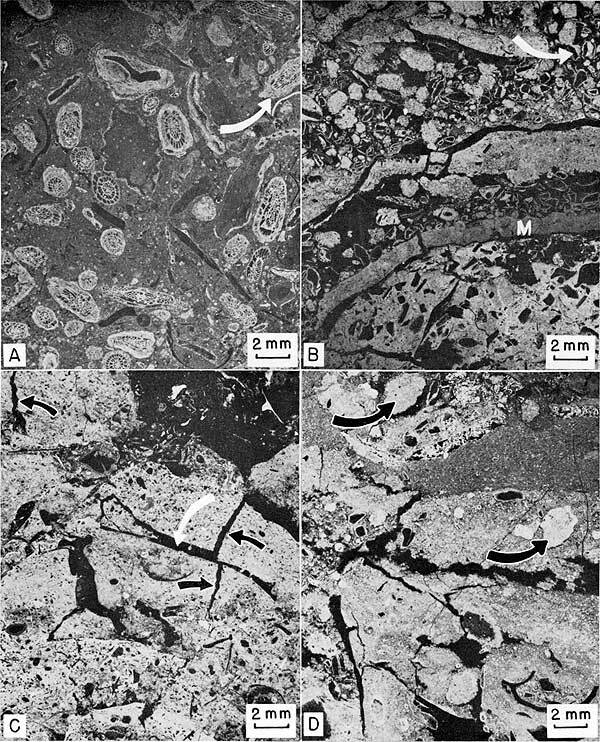 Figure 23--Negative prints of thin sections of oolite and shelly mud facies. Sample number in parenthesis after locality number gives stratigraphic position on Plate 1. A, Contact between oolite and Archaeolithophyllum cap facies, oosparite below. Ooids show well-preserved concentric laminations and some quartz sand nuclei. Lower right is portion of large intraclast of oosparite that has been organically(?) coated (C) then reincorporated into similar oolite. Erosional upper contact (arrows) cuts across ooids. Intrasparrudite overlies erosional contact. Locality 9 (27). B, Oolite facies. Oomicrite. Poorly sorted oolites in micrite. Note oomicrite intraclast in lower center. Small black specks are quartz grains. Locality 5 (16). C, Shelly mud facies near transition to algal-bank facies. Biomicrite. Note poorly sorted skeletal debris and lack of phylloid algae. Locality 3 (1). D, Shelly mud facies near transition to calcarenite facies. Silty biomicrite. Many grains coated by Osagia as in calcarenite facies; some coated only on top. Note algae forming "microhemispheroids" on costae of clam shell (arrow). Many quartz grains present. Locality 23(9). Concentric laminations are preserved in a few ooids, but most have been obliterated by recrystallization or by replacement with dolomite. Many kinds of grains-skeletal fragments of any shape, microcrystalline calcite aggregates, quartz sand-serve as a nucleus for ooids, but the percentage of quartz sand nuclei increases northeastward. This trend parallels the increase in thickness of the terrigenous facies. Near Olathe (Loc. 9) rounded intraclasts of oosparite have been coated with what may be an algal structure (Osagia?) and incorporated into a similar oosparite (Fig. 23, A). The upper surface of this oosparite bed is irregular and truncates individual ooids. The Archaeolithophyllum cap facies overlies this local erosional surface. Fossil assemblage--The fauna of the oolite facies is similar to that of the calcarenite facies but is much less abundant (Table 2). Concentrations of shells, mainly pelecypods, occur at the base of the oolite and along some bedding planes where there are several shale partings. Phylloid algal fragments are found only in shaly, fossiliferous oomicrite layers at the base above the terrigenous facies. Stratigraphic relationships--The oolite facies is well developed in the lower Farley limestone in the east-central part of the study area (see cross section A-A', Pl. 1). This facies is also present on top of the algal-bank facies in the lower Farley at Olathe, Kansas, where it is overlain with erosional contact by the Archaeolithophyllum cap facies of the upper Farley. Field description--The shelly mud facies is essentially a biomicrite superficially resembling the algal-bank facies, with thin, wavy beds and sparse fossils. Petrographic description and fossil assemblage--This facies contains as many fossils as, or more than, the bank facies, but it carries a somewhat different assemblage (Table 2). Phylloid algae are absent in the shelly mud facies, and faunal diversity depends on relationship to adjacent facies. Where the shelly mud facies is laterally equivalent to the algal-bank facies, the assemblage closely resembles that of the algal-bank facies, except for the lack of phylloid algae (Fig. 23, C). In contrast, the fauna of the shelly mud facies is similar to that of the calcarenite facies where these two facies are laterally equivalent (Fig. 23, D). The fauna in the latter case is more abundant than in the former case and contains pelecypod fragments. As in the calcarenite, Osagia encrusts many fragments, but tends to develop more strongly on one side, and in some cases is absent on the underside (Fig. 23, D). Quartz sand is common in this facies to the north. Stratigraphic relationships--Lateral transition from the algal-bank facies to the shelly mud facies in the Argentine (Loc. 29 to 30, 21 to 23) (Kansas City-Olathe-Bonner Springs area) has been described previously. This transition occurs where the limestone thins to less than ten feet around areas of maximum bank development. The shelly mud facies at the north end of the lower Farley (Loc. 23) is laterally transitional into an interbedded oolite and calcarenite facies near Parkville, Missouri (Loc. 19, 21). The gray, sandy shales and thin quartz sandstones comprising the terrigenous facies of the Wyandotte are typical of many late Paleozoic marine terrigenous units in the Midcontinent. These have been shown by Wanless, Tubb, Gednetz, and Weiner (1963) to be pro-delta and delta-front deposits associated with periods of increased terrigenous influx into shallow epicontinental seas where calcium carbonate deposition normally takes place. Swann (1964, p. 651) has pointed out that most thin Mississippian limestone units pinch out into a continuous terrigenous sequence at the margins of depositional basins. Marginal pinchout of the Wyandotte into terrigenous units on the south and west has been documented. A combination of both delta migration (Moore, 1959) and periodic progradation and retrogradation of river systems (Swann, 1964) is probably responsible for the stratigraphically irregular lobate pattern of shales between the marine limestones of the Wyandotte. Persistent lateral extent north of the study area, close association with limestones interpreted to be intertidal and subtidal, and high density of fossils suggest that the Quindaro Shale was deposited very slowly in a shallow, shelf lagoon that extended over much of the basin during Wyandotte deposition. The greater thickness and lobate form of the Island Creek and middle Farley shales suggest that they were closer to the source of sediment supply, that is, the distributary mouth. These units are mostly unfossiliferous, except where transition to limestone occurs and along the thinner distal margins. Parker (1956) and Lagaaij and Kopstein (1964) suggest that fossil density is a function of depositional rate. Parker (1956, p. 361) found that density of shells in Recent sediments of the Gulf Coast is inversely proportional to the sedimentation rate and that the pro-delta silty clays, which have the highest rate of deposition, have the lowest density of shells. Thus it is probable that slower rates of silt and clay deposition at thin distal margins and at vertical transitions to limestone in the Wyandotte shale lobes allowed noticeable accumulation of bioclastic debris, while more rapid deposition of the thicker parts resulted in low fossil density. This low density may have been accentuated by further loss of fossils in post-depositional leaching in the thicker shales, which are now nearly unfossiliferous. Moreover, the more intense terrigenous influx responsible for the thicker shales may have been accompanied by much lower salinities, unfavorable for survival of a normal marine fauna. Then, as influx of terrigenous material and freshwater decreased, a marine fauna was reestablished on top of the shale lobe just before carbonates began to accumulate. Comprising much of the lowest limestone, this is the earliest carbonate facies in the Wyandotte. An intertidal to shallow subtidal environment is strongly indicated by stromatolite-encrusted intraclasts. Where stromatolites are not in place, the large fragments imply that they formed near by. The close association of stromatolites with calcisponges and other marine forms suggests that the intertidal mud flats were interspersed with subtidal areas. Sponges, crinoids, and other organisms probably lived in these slightly deeper areas and then were bound into stromatolites after being thrown up onto the mud flats. Burrowing organisms probably inhabited most of the mud. Mudcracks were sheltered beneath some crusts (Fig. 16, 4), but some partially consolidated carbonate mud was dislodged to form intraclasts, which also became encrusted. The possible presence of pseudomorphs after anhydrite or celestite would attest to restricted water circulation and evaporitic conditions (Illing, Wells, and Taylor, 1965). Because the associated crinoid and brachiopod fauna indicates normal salinity, evaporating pools may have formed on the mud flats, perhaps only during periods of aridity. Evaporites may have been more common during deposition, but were subsequently dissolved, leaving only a few crystals in protected places such as underneath blades of algae (Fig. 16, D). Although framework-building organisms such as corals are not evident, it is probable that phylloid algae were instrumental in the accumulation of abnormal thicknesses of carbonate mud in banks of the Wyandotte. Sediment-trapping by marine grasses is well documented by Ginsburg and Lowenstam (1958) in Recent carbonate mud banks in Florida Bay, but initiation of the pattern of these banks is thought to be a function of complex current patterns and tidal exchanges (Gorsline, 1963). Once initiated, however, luxuriant growth of Thallassia on the banks baffles the currents and allows carbonate mud to settle out, thus perpetuating the bank. As carbonate mud accumulates and is stabilized by the thick growth of grass, interbank areas are maintained and possibly deepened by the greater water flow necessary in constricted areas (Purdy and Imbrie, 1964, p. 35). The potential of phylloid algae as baffles and sediment stabilizers in Pennsylvanian and Permian limestone banks has been pointed out (Harbaugh, 1959, 1960; Konishi and Wray, 1961; Choquette and Traut, 1963; Elias, 1963; Pray and Wray, 1963; and Wray, 1964). Several authors have suggested an analogy in ecologic and sedimentary role between Thallassia and the phylloid algae. Uncalcified plants may have assisted in the trapping of carbonate mud but would not be preserved because of lack of hard parts (Beales, 1963). A feature characteristic of thicker parts of the algal-bank facies is the intraclastic texture of micrite above phylloid algal blades. In horizons where phylloid algal blades are sufficiently abundant to be in contact, there are typically sparry calcite-filled voids under some blades. 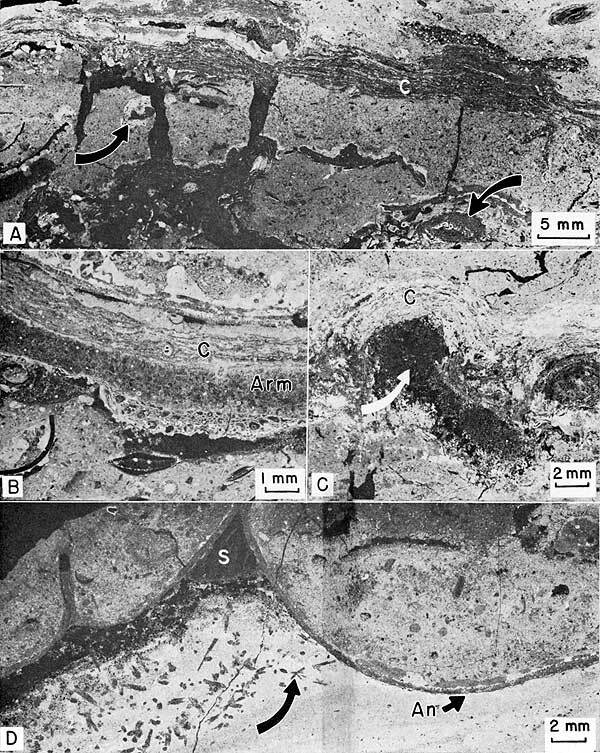 After partial consolidation of the carbonate mud and decay or solution of supporting algal blades, the structure collapsed and brecciated intraclasts caved into the voids (Fig. 19, D). In other cases, layers of biomicrite bounded by encrusting or blade-like forms of phylloid algae appear to have cracked from differential compaction caused by uneven distribution of the layers of algae (Fig. 15, C). A few of these layers were sufficiently disturbed so that the clasts were moved. All varieties of intraclastic texture suggest that the carbonate mud was partially consolidated at or near the surface, either beneath a cover of phylloid algae or beneath a thin layer of overlying sediment. Some intraclasts were covered by algal blades before more carbonate mud could filter into the interstices while other intraclasts were incorporated into carbonate mud of a different texture. The origin of intraclasts, and whether or not they necessarily imply subaerial dessication, is still obscure. Many investigators have pointed out that mud will form cracks while covered by water (Lindstrom, 1963; Van Straaten, 1954; Burst, 1965). These synaeresis cracks supposedly form as a consequence of interparticle ionic attraction, causing rapid squeezing out of interstitial water, the degree of cracking being a function of the amount of clay particle flocculation, which in turn depends on the ionic content of the water (White, 1961). Some of the mud cracks in the algal-bank facies may have formed in this manner, but this would have depended upon the degree of consolidation of the carbonate mud. Modern carbonate sediments under water remain very soft to considerable depth as indicated by many investigators who have commented on how far one may sink into a mud bank. On the other hand, Purdy and Imbrie (1964, p. 34) state that ". . . clasts of plastic lime mud are eroded from the walls and bottom of the adjacent tidal channel in Joulters Cays in the Bahamas. This suggests that lime mud in a tidal channel, which is presumably under water, is coherent enough to form intraclasts. Ginsburg (1957, p. 91) points out that carbonate mud becomes semilithified upon exposure to air and can be rounded into lumps by wave action. Such lumps, or intraclasts, would probably be difficult to differentiate after burial from those formed in a tidal channel. Thus, intraclasts in the algal-bank facies could have formed both subaerially from intertidal mud and subaqueously from subtidal mud. Occurrence of such environments adjacent to one another is supported by recent studies. The intraclasts in Figure 19, B are difficult to distinguish from the surrounding micrite and appear to have been deformed around other clasts. These most probably formed under water and were still soft during burial. On the other hand, intraclasts (Fig. 15, B, D; 19, A) that are angular, that show marked contrast to associated matrix, that are not deformed around other grains, and that were partially unsupported in voids may have formed from subaerially dried mud. The latter are more common in micritic rocks of the Wyandotte. Exclusive occurrence of such intraclasts in thickened portions of the banks suggests that the thickest carbonate mud deposits were formed in areas periodically, but perhaps incompletely, exposed to the air. Little stratigraphic correlation of highly intraclastic horizons between bank areas or within one bank area seems evident. Slightly different rates of mud accumulation or of subsidence, or shifting depositional sites could cause this apparent random distribution. Perpetuation of carbonate mud accumulation, however, was not random and resulted in areas of especially thick deposits and in two successive phases of bank development, one above the other (Fig. 2). Differences in thickness of the bank facies reflect not only higher rates of accumulation, but perhaps also differences in initial bottom topography. Intraclast distribution suggests that water covering areas of thinner carbonate accumulation within the banks was deeper than over the thicker accumulations. Differences in water depth are thought to be slight, most likely less than 25 feet, and the slopes of the banks so gradual as to be difficult to detect. H. G. O'Connor (personal communication, 1967) has found primary dips in algal-bank facies in the Stilwell area. Recent carbonate banks in Florida Bay average a height of 6 feet above interbank areas (Ginsburg, 1956), while carbonate banks in the backreef zone east of the Keys are about 10 feet above the surrounding sea floor (Turmel and Swanson, 1964, p. 26). Carbonate mud in slightly deeper water around these Recent banks is similar to that on the banks and the biota is also similar although somewhat less abundant off the banks. Bank and interbank biotic assemblages are similar in the Wyandotte except for the absence of phylloid algae in the interbank shelly mud facies. Thus carbonate banks in the Wyandotte may not have been elevated much more than 10 feet above the interbank areas. This difference could have been sufficient to bring the tops of the banks into the shallow subtidal and intertidal zones, but a greater difference might have been necessary to keep the interbank area below the optimum depth for growth of phylloid algae, as modern algae live to depths of at least 100 feet (Wray, 1964). Species were calcified, blade-like, and attached to the substrate by means of a rhizome. Thalli grew on both carbonate sand and mud and probably acted as sediment baffles and stabilizers. These forms were normal saline eurytherms that lived in shoal water below low tide, probably in areas of low turbulence such as lagoons. The present study also suggests that Anchicodium was restricted to areas of low turbulence. A typical late Paleozoic marine fauna, dominated by Composita, productids, crinoids, and fenestrate bryozoans, occurs in the phylloid algal carbonate banks. All these organisms presumably lived under water at all times. They most likely inhabited narrow intra- and interbank areas that were continually under water. Upon death, their shells and disarticulated hard parts were distributed throughout the carbonate mud. Several thin layers of shell concentrations in the banks probably represent lag deposits similar to those described by Ginsburg and Lowenstam (1958) in the carbonate banks of Florida Bay. A few organisms such as snails and burrowing worms were probably able to live in wet mud even if exposed intermittently to air. At any one time during bank development only a portion of each area was actually undergoing accumulation, while shallow, narrow, intrabank areas drained from bank areas into the larger and more stable interbank area. Periodic shifting of intrabank and active bank areas resulted in apparently random variation of bank-facies lithology within the major areas of development. Subtidal organisms, living in the slightly deeper intrabank areas, were mixed with algae and other organisms that thrived on the shallower parts of the banks. Locally, lag concentrations of these shells were preserved. Widespread interruption of bank development by changes in physical and chemical conditions resulted in formation of other facies, but in some areas similar conditions returned, and more banks were built directly over the older ones. Thus, pre-existing geometry and hydrography of the area, such as the Lane shoal and interbank channel, determined the position of the carbonate banks of both the Argentine and lower Farley limestones. Subsequent development of the banks themselves depended upon a complex of other factors. The thin layers of Archaeolithophyllum intramicrudite and biolithite of this facies probably formed in a more turbulent environment than that of the algal-bank facies. Supporting evidence is: (1) abundant micrite stabilized and bound by encrustations of Archaeolithophyllum; (2) micrite facies interbedded with biosparite of the calcarenite facies; and (3) clasts of the Archaeolithophyllum cap facies incorporated into the biosparites. Intercalation of the Archaeolithophyllum cap facies and calcarenite facies suggests that their environments were closely related. Better understanding of this association might be gained from analogy with Recent mud banks. Rodriguez Key, one of several carbonate mud banks between a living reef and the Florida Keys, is sheltered on the windward side by the Goniolithon-Porites sand zone (Fig. 24, A). Codiacean algae, mainly Halimeda and Penicillus, produce carbonate mud, and abundant marine grasses and mangroves stabilize the sediment. The muddy area containing the algae is less than two feet below mean low water, whereas the windward skeletal sand zone is intertidal. The mangrove area is 4 inches to 1 foot above mean low water. Figure 24--Comparison of calcarenite and Archaeolithophyllum cap facies environments in Wyandotte with those of a Recent bank (Rodriguez Key) in Florida Bay. A, Cross section of Rodriguez bank (adapted from Turmel and Swanson, 1964). B, Hypothetical cross section of Wyandotte bank. Archaeolithophyllum-bound mud zone is analogous to Recent Thallassia-green algae mud zone, while phylloid algae-crinoid-brachiopod sand zone is analogous to Recent Goniolithon-Porites sand zone. Capping the algal banks of the Wyandotte, prolific growth of Archaeolithophyllum missouriense, crinoids, brachiopods, pelecypods, gastropods, and bryozoans, produced debris that formed a sand bar complex comprising the calcarenite facies. The muddy area behind the sand bar was stabilized by blades of A. missouriense and encrusting A. lamellosum to form the Archaeolithophyllum cap facies (Fig. 24, B). Later shifts in current patterns resulted in interbedding and some mixing of the two different facies capping the algal banks. Species developed as either encrusting, locally attached, or free forms. Thalli were semi-rigid crusts capable of providing a self-supporting skeletal framework and a sediment-binding function in the depositional environment. Thalli are believed to have grown on both carbonate mud and coarser-grained sediment substrata. Based on lithologic evidence and on analogy with Recent coralline algae, Archaeolithophyllum most probably inhabited the inner sublittoral marine environment, being able to tolerate appreciable wave agitation, but it also extended to depths of about 100 feet. In the Wyandotte these algae seem to have thrived in shallower water than suggested by Wray. In contrast to Rodriguez Key, limited abundance and diversity of the biota in the muddy capping environment and the intraclastic texture of the micrite suggest intertidal conditions for the Wyandotte bank. Depositional environment of the calcarenite facies associated with the Archaeolithophyllum cap facies has been discussed in the previous section. Similar carbonate sands also occur in thin sheets interbedded with oosparite in the lower Farley. Very thin layers of grain-supported phylloid algal biomicrudite at the base of these calcarenite beds show that some mud accumulated before the sands were spread into thin sheets and lenses. Constituent grains in the biosparites in the lower Farley in the interbank area are mainly productid shells and crinoid ossicles, whereas intraclasts and phylloid algal fragments are absent. This difference lends further support to a different depositional regimen in this area during lower Farley deposition. Interbank currents were sufficiently strong that carbonate mud did not accumulate and phylloid algae could not find a substrate for attachment. Ginsburg (1960) states that Recent blue-green algal-encrusted grains, or oncolites, which may be analogous to Pennsylvanian Osagia-coated grains, are indicative of low intertidal and shallow subtidal zones. Laporte (personal communication, 1965) has found that oncolites are forming on the Bahama Banks in water 6 feet or less deep, about the same depth at which ooides are forming. This water, however, is less agitated than that in which ooids are forming and oncolites are only occasionally tossed about. There is some correlation in the Wyandotte between abundance of Osagia-coated grains, amount of quartz silt in the calcarenite facies, and thickness ratio of the shale-limestone members of the Wyandotte. These characteristics all increase northeastward and most likely indicate a source direction of terrigenous material and fresh water. The best developed Osagia biosparites of the Wyandotte are overlain by the Bonner Springs Shale, which is interpreted as a prograded delta complex. Abundant occurrence of Osagia-coated grains probably indicates reworking of previously deposited grains in a near-shore, shallow-water environment developed prior to progradation of a delta. Laporte (1962) also found Osagia biosparites in the near-shore facies of the Cottonwood Limestone (Permian) of east-central Kansas. Faunal diversity in the calcarenite is greater than in all other Wyandotte facies (Table 2). The most noticeable fossils in this facies, compared to the micritic facies, are pelecypods, which were not found in either the algal-bank facies or the Archaeolithophyllum cap facies. Pelecypods may have been absent in very muddy areas because of turbidity and poor water circulation. Calcarenites formed in areas where water was sufficiently turbulent to sweep away the mud and sufficiently circulated to supply fresh nutrients and normal salinities, thus allowing establishment of an abundant pelecypod fauna. Ginsburg (1956) reports that clams are very common in the muddy areas of Florida Bay, but these forms may be more tolerant than their ancient relatives. Recent investigations by Newell, Purdy, and Imbrie (1960) show that formation of ooids is related to a sharp physico-chemical gradient along the margin of the Bahama Platform. At the platform edge where water shoals rapidly to a depth of 6 feet or less, turbulence increases greatly and water temperature rises. The water becomes supersaturated with calcium carbonate, resulting in precipitation of concentric laminae of aragonite around any grains that act as nuclei. Ooids then accumulate in cross-stratified lenticular deposits subject to movement by currents. Warmed, supersaturated water and turbulence are postulated, also, for the formation of ooids in Laguna Madre, Texas (Rusnak, 1960), although turbulence seems to be less than in the Bahamas. These authors point out also that accretion of ooids is not actively taking place in all areas where Recent oo1ite deposits are found. Shifting conditions have apparently left certain parts of the area inactive while ooids are actively accreting elsewhere. Some ooids in inactive parts of Bahamian shoals are partially, or wholly recrystallized to cryptocrystalline aragonite, resulting in obliteration of the fine concentric laminations. Lithification of oolites has been observed only in areas that have been subaerially exposed (Ginsburg, 1957). Some of the Wyandotte oolitic deposits were lithified, then broken into intraclasts that have been rounded and coated with a light-colored layer of calcite before being deposited again in more oolite (Fig. 23, A). It is not known whether this white coating is organic or inorganic in origin. The rounded intraclasts of oosparite and the erosional upper contact (Fig. 23, 4) with truncated ooids beneath intramicrudite of the Archaeolithophyllum cap facies indicates that lithification was probably due to subaerial exposure. Recent oolite deposits that have not been exposed to the air are loose and would not produce eroded surfaces that truncate the grains. Interbedded biosparites of the calcarenite facies and oosparites and oomicrites of the oolite facies indicate that these sediments formed contemporaneously side by side. Similar biota inhabited both facies (Table 2), but their abundance is much less in the oolite. Apparently, as in the Bahamas, organisms found it difficult to live in an area of active oolite formation but were able to inhabit the same area during periods of nonaccretion. In addition, skeletal debris from the nearby calcarenite facies probably was transported into the oolite. Recent sediments resembling the oomicrite with algal-coated ooids encountered at Locality 5, are found at Joulters Cays in the Bahamas where an oolite shoal is prograding bank-ward over an older carbonate mud area, resulting in a mixture of the two sediments. The abundance of micrite and the normal-marine but non-algal biota that characterize the shelly mud facies indicate that (1) current strength and turbulence were sufficiently low to permit accumulation of carbonate mud without the aid of sediment-stabilizing phylloid algae; (2) water was normally saline in order to support the brachiopod-crinoid-bryozoan fauna; and (3) water was not shallow enough for proliferation of algae. The environment of this facies contrasts markedly with that of surrounding environments. Absence of phylloid algae in the interbank area and thinness of the shelly mud facies suggests slightly deeper water than that over the bordering algal banks. Stronger currents may have prevented accumulation of much available carbonate mud, accounting for thinness of the facies. Shelly mud facies adjacent to the calcarenite and oolite facies underwent less wave and current action. It may have been that water was slightly deeper, or that the shelly mud facies formed in a sheltered area behind the calcarenitic and oolitic areas that bore the brunt of wave and current action. The latter alternative is less likely, however, as such sheltered areas might support only a restricted biota, like that of the Archaeolithophyllum cap facies. Some organisms such as pelecypods and Osagia, which are characteristic of the calcarenite facies, had ecologic ranges that extended into the adjacent shelly mud environment, although the smaller grains could have been transported in by currents. Carbonate sedimentation is sensitively controlled by the topography and geometry of the basin of deposition (Illing, 1959; Ginsburg, Lloyd, Stockman, and McCallum, 1963; Laporte and Imbrie, 1964). This would have been especially true in the shallow epicontinental seas that covered parts of the North American Continent during the late Paleozoic because slight variations in bottom topography, depth of water, water circulation, and patterns of terrigenous sediment influx would effect greatly the distribution of carbonate facies. It is, therefore, important to consider the nature of the Lane Shale and the inferred topography after deposition because of its potential effect on subsequent carbonate deposition of the Wyandotte. Characteristics of the Lane Shale compare favorably with similar deposits considered by Moore (1959) and Wanless, et al. (1963) as deltaic complexes--thin distributary channels, interdistributary bays, and pro-delta lobes. What is most important, however, in evaluating deposition of the Wyandotte, is the final topography of the Lane deltaic platform. The Lane is unusually thick on the northwest side of the interbank area in Johnson County, Kansas (Fig. 2, 4). It thins abruptly into the interbank area and thickens to the southeast. Northeastward, the Lane thins to about 30 feet and remains constant to the northern edge of the study area. Newell (1935) and Jewett and Newell (1935) show that there is no consistent relationship between thickness variation in the Lane Shale and the underlying relatively constant Iola Limestone (Linn Subgroup). The Lane Shale does not appear to be filling depressions in the underlying Iola Limestone, primarily because the Iola does not undergo much thickness variation in this area. The largely intertidal stromatolite-sponge facies of the Frisbie occurs only northwest of the interbank area. The algal banks to the north of the shoal thin abruptly over the shoal (Pl. 1). The shelly mud facies suggesting deeper water occurs in the interbank area southeast of the shoal. Cessation of Lane terrigenous clastic influx left a shallow, undulatory platform adjacent to a deeper area. Organisms that had been excluded from the highly turbid and possibly brackish water reestablished themselves across this platform, and skeletal debris began to accumulate with minimum dilution by terrigenous material. Intertidal carbonate mud flats began to cover the restricted area behind (north of) the Lane shoal (Fig. 25, A). Blue-green algal mats formed on the exposed flats and trapped carbonate mud, forming laminar structures preserved as stromatolites. Skeletal debris derived from biota living on the flats, as well as in shallow areas that drained the flats, was incorporated into the carbonate mud and encrusted by the algal mats. Organisms such as encrusting bryozoans and tetrataxid and calcitornellid foraminifers lived within or on the algal mats themselves. Calcisponges, crinoids, brachiopods, and Anchicodium probably lived in the slightly deeper areas and after death were thrown up onto the mud flats by waves. General restriction of water circulation prevented complete oxidation of organic matter, resulting eventually in formation of disseminated sulfides, which give the micrite a dark color. Evaporite minerals, such as anhydrite or celestite, may have formed in isolated supersaturated pools on the shallow mud flats. Most of the crystals of the evaporite minerals probably were dissolved later by a less saline water influx, but a few were preserved as pseudomorphs beneath algal blades. Constant shifting of mud flats resulted in the formation of a unit of mixed intertidal, algal-stromatolite, and subtidal skeletal carbonate comprising the Frisbie Limestone on the platform. Tidal-flat carbonate deposition was interrupted by a brief influx of terrigenous material forming the Quindaro Shale which covered the stromatolite-sponge facies behind the Lane shoal. On the Lane shoal, the Frisbie was not deposited, and so the top of the Lane Shale is indistinguishable from the Quindaro Shale (Fig. 25, B). Immediately following the influx of the Quindaro Shale, restricted intertidal conditions returned briefly to a few small areas toward the north, but in other areas, perhaps deeper water with less restricted circulation prevailed. Carbonate mud containing abundant phylloid algae began to accumulate as elevated banks in the Stilwell, Kansas City, and Olathe-Bonner Springs areas. A single bank may have covered only a portion of these areas at any one time (Fig. 25, B), but major circulation patterns controlled by the Lane shoal and the deeper area to the south, confined bank formation to the areas named above. Banks shifted laterally within these areas, resulting in thick carbonate mud accumulation during deposition of most of the Argentine (Fig. 25, B, C). Blades of phylloid algae, mainly Anchicodium, acted as baffles to slow water velocity and to trap carbonate mud that settled out. The more shallow bank areas were favorable for maximum algal growth and probably also for higher rates of carbonate mud production. This interaction tended to be self-perpetuating until major changes in water circulation forced a shift in deposition. The shallow water over the banks was perhaps even intertidal at times. The relief of individual banks was more than likely only a few feet above the surrounding sea floor, and there was little difference between sediments on the bank and in the intrabank areas. Moreover, active bank areas and intrabank channels probably shifted around to such an extent that the deposits have become more or less homogeneous and difficult to differentiate on outcrops of the Argentine. Less sediment, with essentially no phylloid algal fragments, accumulated in the deeper interbank area, resulting in the formation of the thin shelly mud facies (Pl. 1; Fig. 25, B, C). The Argentine phase of algal-bank formation was culminated by increases in wave and current energy. Skeletal sands were washed up along the margins of the algal banks while blade-like and encrusting forms of the red alga Archaeolithophyllum stabilized carbonate mud on top of the banks behind the carbonate sand bars (Fig. 24, B; 25, C). Before final burial these skeletal sands were spread into lenses and sheets and mixed with large intraclasts of Archaeolithophyllum biomicrite. As the interbank area received none of this facies mixture, it was apparently swept clear at this time. Northeast of the Kansas City bank area, Osagia-coated grains in otherwise similar carbonate sand were deposited on top of much thinner algal carbonate mud. The carbonate sediments were then covered by an influx of terrigenous clastics, apparently from the north or northeast. These muds and sands of the Island Creek Shale Member formed a thick lobe southward between carbonate banks in central Johnson County, accumulating to 7 or 8 feet in the interbank area, and lapping up onto and thinning over the surrounding algal banks (Fig. 25, D). The thick shale lobe in Johnson County controlled water circulation at the start of the second phase of algal-bank formation. In the second, or lower Farley bank phase, thick accumulation of phylloid algal carbonate mud occurred directly above the Argentine banks in the Stilwell and Olathe areas (Fig. 2). Although banks of the second phase were considerably more limited geographically, they attained thicknesses similar to those below and contained consistently more abundant phylloid algae. The second phase was terminated, like the first, with development of Archaeolithophyllum mud, skeletal sands, and oolite. Oolite bars formed in certain limited areas on top of the second Olathe bank near Locality 9 and also around Kansas City. From the latter area oolites were carried northward from the shoals and mixed with carbonate mud at Locality 5, and remained to form cross-stratified oosparites farther northward at Localities 19 and 21. The result of this period of turbulent sedimentation was nearly complete capping of the second phase of algal banks with oolite and/or calcarenite facies, as well as covering portions of the Island Creek Shale where no algal banks had formed (Fig. 25, E). Once again terrigenous influx flooded most of the carbonate area and accumulated to greatest thicknesses between the lower Farley banks. A recurrence of the Archaeolithophyllum cap facies, locally interbedded with biosparites of the calcarenite facies, covered the middle Farley shale in the Stilwell and Olathe-Bonner Springs areas. This accumulation is considered to be the third and final phase of Wyandotte bank development, where it attains 20 feet at Bonner Springs (Fig. 25, F). Osagia-coated, well-washed skeletal sands covered the middle Farley shale north of Kansas City. This final carbonate phase was covered by the prograding Bonner Springs deltaic complex. Bonner Springs clastics filled the interbank area to a great thickness, and cut into the top of the Wyandotte in several places, perhaps as distributary channels. Figure 25--Series of block diagrams illustrating successive development of facies in the Wyandotte. Area shown is marked by numbered localities (Fig. 1, 2) and covers Johnson and southern Wyandotte and Leavenworth counties, Kansas, where algal banks are best developed. A, During Frisbie Limestone deposition. B, At end of algal-bank deposition in Argentine. C, At end of Argentine Limestone deposition. D, At end of Island Creek Shale deposition. E, At end of lower Farley deposition. F, At end of upper Farley deposition. Detailed biofacies and lithofacies analysis of the Wyandotte Limestone has resulted in the definition of seven environmentally significant facies: (1) terrigenous, (2) stromatolite-sponge, (3) algal-bank, (4) Archaeolithophyllum cap, (5) calcarenite, (6) oolite, and (7) shelly mud. The carbonate facies were all deposited in a well-lighted, very shallow epicontinental sea ranging from intertidal to probably less than 25 feet in depth. Initial position of the algal carbonate mud banks of the Wyandotte was determined by preexisting geometry and hydrography of the basin, manifested by the irregular surface of the underlying Lane Shale deltaic platform and shoal. These shallow banks provided suitable conditions for growth of the calcareous phylloid algae Anchicodium and Archaeolithophyllum, which in turn produced baffles for the water currents and stabilized the mud, thus perpetuating bank development. Bank upbuilding altered the basic geometry and hydrography of the area and was terminated by subsequent changes in water turbulence and circulation, which resulted in the deposition of associated carbonate facies (Table 5). Carbonate deposition was periodically interrupted by terrigenous influx but subsequently resumed in much the same pattern, resulting in bank development in some of the same areas. Environmental interpretation of the Wyandotte facies is compatible with recent detailed environmental analyses of terrigenous phases of Midcontinent late Paleozoic cyclic deposits (Swann, 1964; Wanless, et al., 1963; Moore, 1959). Many details of vertical and lateral facies changes in the Wyandotte are understandable in terms of shallow-marine environments related to shifting or prograding deltaic complexes. In shallow environments, rapid but consistent changes in water turbulence and circulation patterns occurred following changes in amount and direction of terrigenous and fresh water influx, producing a vertical sedimentary sequence that is repeated several times. Nature of the substrate, variation in salinity, water turbulence, and amount of water circulation were the main limiting factors in distribution and abundance of the Wyandotte biota. Distinctive fossil assemblages characterize each of the facies, although there is a great deal of overlap in the occurrence of several ubiquitous organisms (Composita, crinoids, and bryozoans). Some mixing of skeletal debris from adjacent environments is also apparent. The algal-bank complex in the Wyandotte is similar to those in the Lansing Group, which overlies the Zarah Subgroup in the Midcontinent area (Harbaugh, 1959, 1960). These banks also compare favorably with those described from the Paradox Basin (Choquette and Traut, 1963; Elias, 1963; and Pray and Wray, 1963). Phylloid algae are much more abundant in the Paradox banks and there is also a related evaporite sequence with no known analogy in the Midcontinent banks. Table 5--Relationship of carbonate facies to variations of two controlling factors. Bathhurst, R. G. C., 1964, The replacement of aragonite by calcite In the molluscan shell wall; in, Approaches to Paleoecology, John Imbrie and Norman Newell, eds. : John Wiley & Sons, Inc., N.Y., p. 357-376. Beales, F. W., 1963, Baldness of bedding surface: Am. Assoc. Petroleum Geologists, Bull., v. 47, p. 681-686. Beales, F. W., 1965, Diagenesis in pelletted limestones; in, Dolomitization and Limestone Diagenesis, L. C. Pray and R. C. Murray, eds. : Soc. Econ. Paleont. & Mineral., Spec. Pub. no. 13, p. 49-70. Burchett, R. R., 1959, Stratigraphy of the upper part of the Kansas City Group (Pennsylvanian) in southeastern Nebraska and adjacent regions: Unpublished Master of Science dissertation, Dept. Geol., Univ. Nebraska, 87 p.
Burst, J. F., 1965, Subaqueously formed shrinkage cracks in clay: Jour. Sed. Petrology, v. 35, p. 348-353. Dunham, R. J., 1962, Classification of carbonate rocks according to depositional texture; in, Classification of Carbonate Rocks--a Symposium, W. E. Ham, ed. : Am. Assoc. Petroleum Geologists, Mem. 1, p. 108-121. Folk, R. L., 1959, Practical petrographic classification of limestones: Am. Assoc. Petroleum Geologists, Bull., v. 43, p. 1-38. 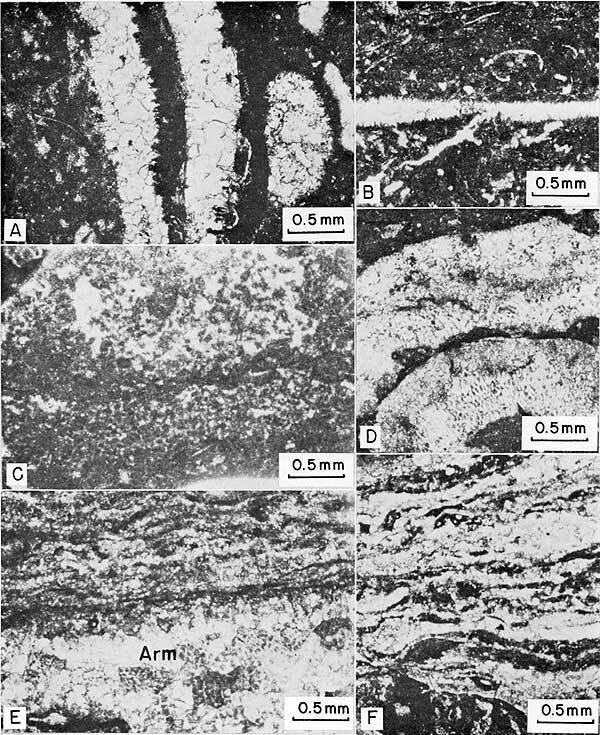 Friedman, G. M., 1964, Early diagenesis and lithification in carbonate sediments: Jour. Sed. Petrology, v. 34, p. 777-813. Ginsburg, R. N., 1956, Environmental relationships of grain size and constituent particles in some South Florida carbonate sediments: Am. Assoc. Petroleum Geologists, Bull., v. 40, p. 2384-2427. 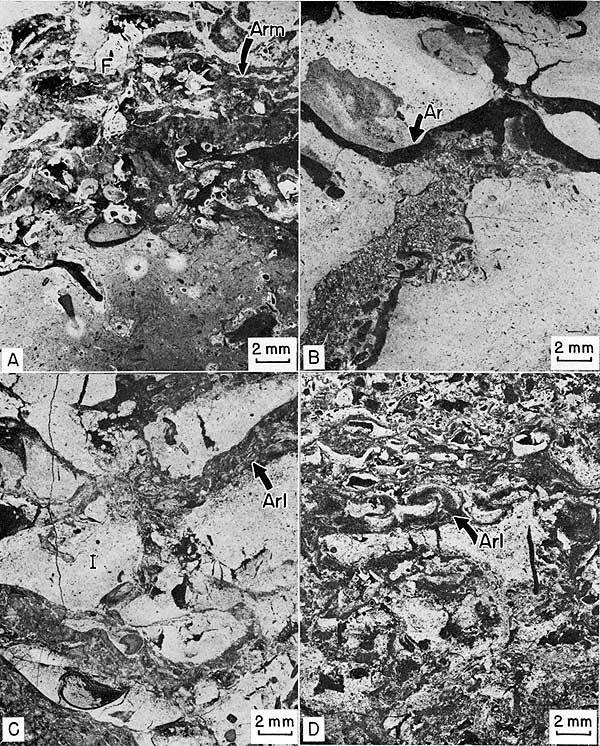 Ginsburg, R. N., 1957, Early diagenesis and lithification of shallow-water carbonate sediments in South Florida; in, Regional Aspects of Carbonate Deposition, R. J. LeBlanc and J. G. Breeding, eds. : Soc. Econ. Paleont. & Mineral., Spec. Pub. no. 5, p. 80-100. Ginsburg, R. N., Lloyd, R. M., Stockman, K. W., and McCallum, J. S., 1963, Shallow-water carbonate sediments; in, The Sea, M. N. Hill, ed. : Interscience Pub., John Wiley & Sons, Inc., N.Y. v. 3, p. 554-582. Ginsburg, R. N., and Lowenstam, H. A., 1958, The influence of marine bottom communities on the depositional environment of sediments: Jour. Geology, v. 66, p. 310-318. Gorsline, D.S., 1962, Environments of carbonate deposition, Florida Bay and the Florida Straits; in, Shelf Carbonates of the Paradox Basin: Four Corners Geol. Soc., Guidebook, 4th Field Conf. Symp., p. 130-143. Illing, L. V., 1959, Deposition and diagenesis of some Upper Paleozoic carbonate sediments in Western Canada; in, 5th World Petrol. Cong., N.Y., Proc., sec. 1, p. 23-52. Johnson, J. H., 1946, Lime-secreting algae from the Pennsylvanian and Permian of Kansas: Geol. Soc. America, Bull., v. 57, p. 1087-1120. Johnson, J. H., 1956, Archaeolithophyllum, a new genus of Paleozoic coralline algae: Jour. Paleontology, v. 30, p. 53-55. Johnson, J. H., 1961, Limestone-building algae and algal Limestones: Colorado School Mines, Boulder, Colo., 297 p.
Khvorova, I. V., 1946, On a new genus of algae from the Middle Carboniferous deposits of Moscow Basin: Akad. Nauk SSSR, Doklady, v. 53, p. 737-739. Konishi, Kenji, 1961, Studies of Paleozoic Codiaceae and allied algae, Part 1, Codiaceae: Sci. Repts. Kanazawa Univ., v. 71 no. 2, p. 159-261. Konishi, Kenji, and Wray, J. L., 1961, Eugonophyllum, a new Pennsylvanian and Permian algal genus: Jour. Paleontology, v. 35, p. 659-666. Lagaaij, Robert, and Kopstein, F. P. H. W., 1964, Typical features of a fluviomarine offlap sequence; in, Developments in Sedimentology, v. 1, Deltaic and Shallow Marine Deposits, L. M. J. U. van Straaten, ed. : Elsevier Publishing Co., Amsterdam, p. 216-226. Laporte, L. F., 1962, Paleoecology of the Cottonwood Limestone (Permian), northern Mid-continent: Geol. Soc. America, Bull., v. 73, p. 521-544. Lindström, Maurits, 1963, Sedimentary folds and the development of limestone in an Early Ordovician sea: Sedimentology, v. 2, p. 243-276. Logan, B. W., Rezak, R., and Ginsburg, R. N., 1964, Classification and environmental significance of algal stromatolites: Jour. Geology, v. 72, p. 68-83. Maslov,	R. B., 1956, Iskopaemye izvestkovye vodorosli SSSR [Calcareous algae of the USSR]: Akad. Nauk SSSR, Trudy Inst. Geol. Nauk, no. 160, 301 p.
Moore, Derek, 1959, Role of deltas in the formation of some British Lower Carboniferous cyclothems: Jour. Geology, v. 67, p. 522-539. Parkhurst, R. W., 1959, Subsurface to subsurface correlation of Lansing-Kansas City rocks (Pennsylvanian) in Kansas: Kansas Geological Society, Guidebook, 24th Field Conf., p. 94-100. Pray, L. C., and Wray, J. L., 1963, Porous algal facies (Pennsylvanian), Honaker Trail, San Juan Canyon, Utah; in, Shelf Carbonates of the Paradox Basin: Four Corners Geol. Soc., Guidebook, 4th Field Conf. Symp., p. 204-234. Purdy, E. G., and Imbrie, John, 1960, Bahamian oolitic sands: Jour. Geology, v. 68, p. 481-497. Parker,	R. H., 1956, Macro-invertebrate assemblages as indicators of sedimentary environments in east Mississippi Delta region: Am. Assoc. Petroleum Geologists Bull., v. 40, p. 295-376. Purdy, E. G., 1963, Recent calcium carbonate facies of the Great Bahama Bank, 1. Petrography and reaction groups; 2. Sedimentary facies: Jour. Geology, v. 71, p. 334-355; p. 472-497. Purdy, E.G., and Imbrie, John, 1964, Carbonate sediments, Great Bahama Bank: Geol. Soc. America, Guidebook, 1964 Field Trip No. 2, p. 1-58. Rusnak, G. A., 1960, Some observations of Recent oolites: Jour. Sed. Petrology, v. 30, p. 471-480. Searight, W. V., and Howe, W. B., 1961, Pennsylvanian System; in, The Stratigraphic Succession in Missouri, J. C. Koenig, ed. : Missouri Geol. Survey & Water Resources, v. 40, ser. 2, p. 78-122. Straaten, L. M. J. U. van, 1954, Composition and structure of Recent marine sediments in the Netherlands: Leidse Geol. Med., v. 19, p. 1-110. Swann,	D. H., 1964, Late Mississippian rhythmic sediments of Mississippi Valley: Am. Assoc. Petroleum Geologists, Bull., v. 48, p. 637-658. Toomey, D. F., 1962, Note on a supposed "algal-foraminiferal consortium" from the Permian of West Texas: Contrib. Cush. Found. Foram. Res., v. 13, p. 52-54. Turmel, Real, and Swanson, Roger, 1964, Rodriguez Bank: Geol. Soc. America, Guidebook, 1964 Field Trip No. 1, p. 26-44. Wanless, H. R., Tubb, J. B., Jr., Gednetz, D. E., and Weiner, J. L., 1963, Mapping sedimentary environments of Pennsylvanian cycles: Geol. Soc. America, Bull., v. 74, p. 437-486. White, W. A., 1961, Colloid phenomena in sedimentation of argillaceous rocks: Jour. Sed. Petrology, v. 31, p. 560-570. Wilson,	F. W., 1957, Barrier reefs of the Stanton Formation (Missourian) in southeast Kansas: Kansas Acad. Sci., Trans., v. 60, p. 429-436. Placed on web March 30, 2009; originally published in Nov. 1969.